Hollywood has told the story of how Monuments Men retrieved artworks that had been looted by Nazis. Newly discovered archival information brings to life the untold story of what they did next at the U.S. Army’s Office of Military Government at the Central Collecting Point (CCP) in Munich. How did the so-called ‘Monuments Men’ transform the war-damaged former Nazi Party headquarters in Munich into the largest ‘museum’ and greatest art history project that had been undertaken? How did they create the incredible expertise to identify the artworks? How did they build the infrastructure to restitute the objects? And, as millennia of priceless treasures of European cultural heritage were being gathered under one war-damaged roof, who could be trusted? Dr Iris Lauterbach presents her new research on the events, people, and intrigue of the Munich CCP in the crucial years 1945–1949. 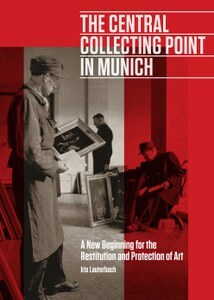 Based on previously unpublished records, archives, and photographs, she uncovers the stories of the people who worked there at a time of lingering political suspicions; narrates the fascinating research, conservation, and restitution processes; and investigates how works of art were managed and restituted to their owners. It is also the remarkable story of the foundation of Germany’s Central Institute for Art History: the library that powered the CCP’s knowledge base has grown into the one of the world’s largest art history reference libraries, where she is a researcher. For further information on this event, click here. Free, all welcome, RSVP here.